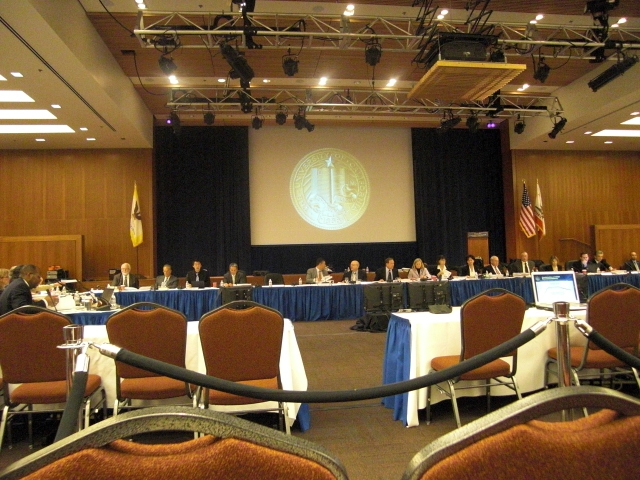 SAN FRANCISCO — UC Regents may vote on a costly retirement reform plan next month that officials say will not only lower benefits, but could squeeze faculty recruitment, research and medical centers for two or more decades. An institution known for its prized collection of intellects did something two decades ago that in hindsight now seems unwise. It stopped making employer-employee contributions to the pension system, getting by on strong investment earnings. But as of last July the system was 73 percent funded using the market value of assets and 87 percent funded on an actuarial basis, which spreads gains and losses over five years and won’t fully reflect the 2008 stock market crash losses until 2013. “The idea of having a defined benefit and not paying into it is insanity,” Richard Blum told his fellow Regents at a meeting this month. He said he began urging that contributions be restarted several years ago. Action by the Regents restarted contributions last April with 2 percent of pay from employees (if bargained with unions) and 4 percent from the university, expected to grow respectively to 5 and 10 percent by 2012. The regents may vote Dec. 13 on a long-term plan that would cut costs in two ways — lower pensions for new hires and lower retiree health coverage for new hires and more than half of current employees. The heart of the plan to restore the UC Retirement Plan’s funding level, and begin erasing a $12.9 billion unfunded liability, is an increase in the UC employer contribution to about 20 percent of pay, which would be roughly $1.5 billion in the current budget. After the UC employer contribution reaches 10 percent of pay in 2012, the plan calls for UC to increase its contribution by 2 percent of pay per year until reaching the goal of about 20 percent of pay. UC would like to get state funds for retirement, like California State University and the community colleges. But one of the consequences of stopping contributions two decades ago is that UC retirement is not part of the state budget. Now the timing for getting UC retirement back into the state budget could not be much worse. Nonpartisan Legislative Analyst Mac Taylor estimated earlier this month that the state has a $25 billion budget shortfall with no relief in sight. He expects shortfalls of about $20 billion in each of the next five years. UC is making some progress with the Legislature. Language in the state budget last year declaring that there would be no new general fund spending on UC retirement was deleted in the current budget. A provision in the current budget directing UC to prepare a long-term retirement funding plan, with a proposal for state contributions, was vetoed by Gov. Schwarzenegger. “Based on discussions with UC, however, we estimate that their proposal could call for state general fund contributions exceeding $400 million annually by the end of the (five-year) forecast period,” said the Legislative Analyst’s budget outlook. UC officials say not getting state money is a triple hit on the retirement system. The state provides a third of the UC budget. The rest comes from medical centers, federal sources, grants and other operations. Without an increase in the state share, UC cannot equitably raise retirement contributions from the other two-thirds of its operations. So every $1 not received from the state costs UC an additional $2 from other sources. To restart the employer contribution this year with 4 percent of pay, UC dipped into other funds, using student fees and “redirecting campus resources,” the September staff report said. For additional contributions UC is exploring several possibilities, including restructuring debt and borrowing at low interest rates from its pool of short-term investments. That appears to be a better solution than a $4.5 billion pension bond suggested by the Academic Senate, the UC chief financial officer, Peter Taylor, told the Regents. He said he may give the Regents a specific funding proposal in March. “We are modeling sustained 20 percent employer contributions, which is a very high number and will be an enormous impact on the operating budget of our campuses for the next 20 years,” Taylor said. He said if UC employment is flat, rather than growing at 1 percent as the model assumes, the high contributions could continue for an additional decade. UC also assumes investment earnings will average 7.5 percent, which some think is too optimistic. UCLA Chancellor Gene Block gave the Regents some examples of the impact of high retirement contributions: reduced faculty recruitment, less staff support, potential cuts in research and outreach, and tighter operating margins for medical centers. “I believe there is an opportunity for UCLA and other campuses to mitigate some of the potential damage to the campus by enhancing our current revenue sources,” Block said. “However, this is a breath-taking cost to our campuses and for many years in the future we are going to have to be dealing with making up for a very large change in our operating revenues,” he said. Under the cost-cutting parts of the reform plan, UC support for retiree health insurance would drop from 89 percent of the cost to 70 percent. About 45 percent of current workers would not be affected by the change. The minimum retirement age for employees hired after July 1, 2013, would be extended from 50 to 55 and the age for maximum benefits from 60 to 65. The start date is delayed to provide time to negotiate with 28 labor bargaining units. The pension formula for the new hires (current workers have vested pension rights protected by the courts) would be 2.5 percent of the highest three-year average for each year served at age 65, not at age 60 as for current workers. UC officials said the pension for new hires is less generous than the pension benefits for most state workers and teachers. Unlike UC and state employees, members of the California State Teachers Retirement System do not receive Social Security. New hires would contribute 7 percent of pay to the retirement system, and the UC employer would contribute 8.1 percent of pay. From 1976 to 1990 when contributions stopped, said a staff report, employees contributed 5 to 7 percent of pay and UC as much as 16.37 percent.